LOS ANGELES, Nov. 14, 2017 – Through their exclusive partnership, Delta Air Lines and the Lakers are joining forces to launch the season-long "Salute To Our Troops" program, beginning at the Lakers home game on Nov. 15, 2017. This special program will honor U.S. military living and stationed in Southern California, highlighting their career paths, unique journeys and commitment to serve our country. During the Lakers home game on Nov. 15 vs. Philadelphia 76ers, Larry Nance Jr. will honor his childhood pen pal, Specialist Bianca Campbell. When serving in the United States Army in 2003, Campbell exchanged hand-written letters with a 10-year-old Nance Jr. On July 21, 2017, Campbell posted photos of one of Nance Jr.'s letters on Twitter. Nance Jr. responded to Campbell the next day and invited her to be his guest at a Lakers home game. The Los Angeles Lakers and Delta Air Lines have teamed up to bring Campbell to Los Angeles, where she will meet now 24-year-old Nance Jr. in person for the first time. In addition to in-game recognition, Bianca, along with all future honorees throughout the season, will receive tickets to that night's game, a custom Lakers jersey, a challenge coin and the opportunity to attend a Lakers practice to meet players and coaches. Honorees will be selected in conjunction with the Bob Hope USO. Additional games nights honoring military members include December 29, January 19, February 6, March 7 and March 30. 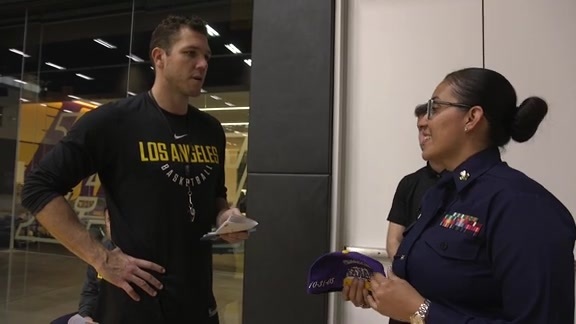 "Honoring service members and their families that sacrifice so much is very important to the Lakers," said Mathew Makovec, the Lakers Director of Community of Relations. "Our Salute to our Troops events with Delta Air Lines are a direct way to provide an amazing one-of-a-kind experience for these deserving individuals. We want to let service members know we are here to support them, as they support us, serving both in Southern California and abroad." "Delta employs more than 10,000 veterans and is a long-time supporter of the U.S. Armed Forces, so honoring our troops is important to Delta people and a foundational pillar of our community engagement efforts," said Ranjan Goswami, Vice President-Los Angeles and Sales, West at Delta Air Lines. "Through our Salute to Our Troops program in partnership with the Lakers and the Bob Hope USO at LAX, we are proud to honor military members who live in greater Los Angeles as a token of thanks for their service to our country." 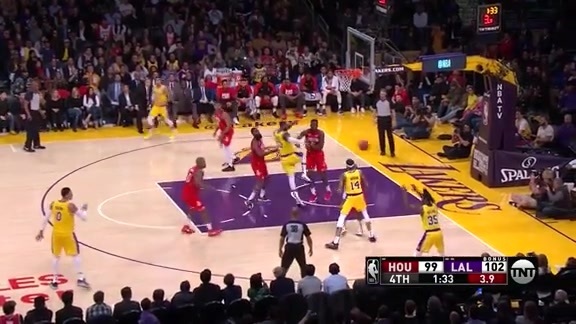 Delta has been the Official Airline Partner of the Lakers since 2010. Throughout the 2017-18 season, Delta and the Lakers are hosting "TakeOff To Tipoff" Sweepstakes around key Lakers cultural moments – including the schedule release and season opener – to send fans to their dream Lakers road destinations. The sweepstakes is part of Delta's ‘Dream Up, LA' campaign, which celebrates hardworking, passionate Angelenos who aspire to achieve their dreams. Since 2009, Delta has been the fastest-growing carrier at LAX, more than doubling its number of seats and growing from 70 daily departures to more than 175. In May, Delta relocated to Terminals 2 and 3 at LAX, the first step in its plan to modernize, upgrade and connect Terminals 2 and 3 over the next few years as part of the $1.9 billon Delta Sky Way at LAX. The airline continues to build on its efforts to serve the specialized needs of customers in the Los Angeles entertainment, production and tech industries through nonstop service to top industry destinations, exclusive partnerships that provide in-flight content on Delta Studio, and curated travel experiences like the Delta Festival Shuttle. Delta's commitment to Los Angeles also means more than providing exceptional service in the skies and on the ground at LAX. Its 4,200 LA-based employees are also deeply integrated into the community, working with organizations and supporting causes that are near and dear to the hearts of Angelenos. Delta Air Lines serves nearly 180 million customers each year. In 2016, Delta was named to Fortune's top 50 Most Admired Companies in addition to being named the most admired airline for the fifth time in six years. Additionally, Delta has ranked No.1 in the Business Travel News Annual Airline survey for an unprecedented five consecutive years. With an industry-leading global network, Delta and the Delta Connection carriers offer service to 312 destinations in 54 countries on six continents. Headquartered in Atlanta, Delta employs more than 80,000 employees worldwide and operates a mainline fleet of more than 800 aircraft. The airline is a founding member of the SkyTeam global alliance and participates in the industry's leading transatlantic joint venture with Air France-KLM and Alitalia as well as a joint venture with Virgin Atlantic. Including its worldwide alliance partners, Delta offers customers more than 15,000 daily flights, with key hubs and markets including Amsterdam, Atlanta, Boston, Detroit, Los Angeles, Minneapolis/St. Paul, New York-JFK and LaGuardia, London-Heathrow, Paris-Charles de Gaulle, Salt Lake City, Seattle and Tokyo-Narita. Delta has invested billions of dollars in airport facilities, global products and services, and technology to enhance the customer experience in the air and on the ground. Additional information is available on the Delta News Hub, as well as delta.com, Twitter @DeltaNewsHub, Google.com/+Delta, and Facebook.com/delta. 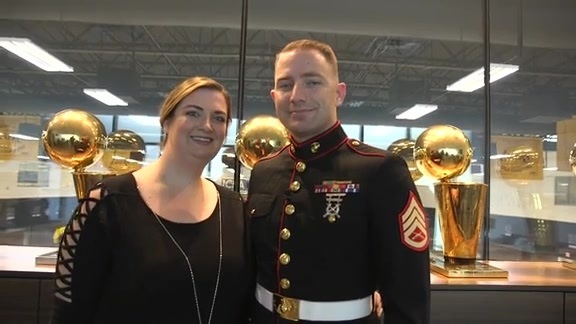 SSgt Kevin C. Wingenroth of the U.S. Marines was honored as part of the season-long @Delta Salute To Our Troops program. After receiving a behind the scenes tour and meeting the team at practice, he was honored at center-court during our game. Storekeeper First Class Belén Guzmán was honored as part of the Delta season-long Salute To Our Troops program. After receiving a tour and meeting the team at practice, she was honored at center-court during our game. 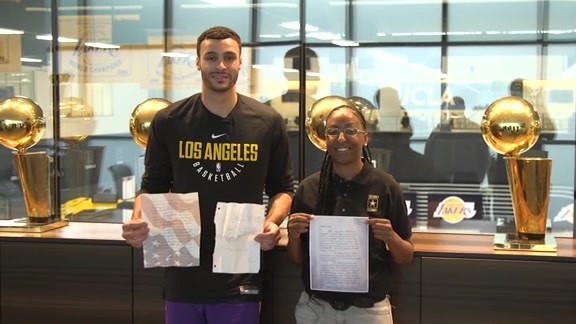 During the Lakers home game on Nov. 15 vs. the Philadelphia 76ers, the Lakers and Larry Nance Jr. honored his childhood pen pal, Specialist Bianca Campbell.